To all Members, Friends and Partners of Metro Blind Sport! 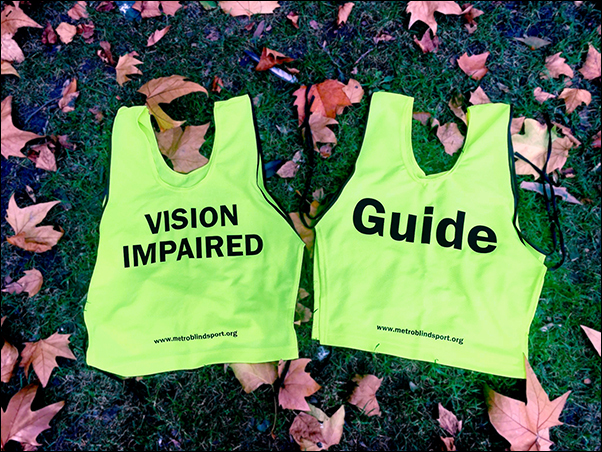 We now have in stock bright Yellow high Viz Bibs, one with “ Guide” front and back, and one with “ Vision Impaired” front and back, both with ties either side. These can be worn over the top of sweatshirts and waterproofs. These are ideal for parkruns, training around your local area, and competitions. We have purchased these from the same supplier used by London Marathon. With dark evenings drawing in make sure you are seen and safe!!. These tops are free of charge to all Metro members, TPT family, Partners, Metro Fund Raisers and to your guide runner. If you would like me to post them to you direct, please let me have your full postal address and let me know if you require one of each. BBS have produced a range of tethers for recreational guide running to allow blind and partially sighted runners to run freely alongside their guide. The tether rules only apply to track and road competitions/championships with a UK Licence / UK Rules / WPA Rules. Open races i.e. mass participation and Park Runs fall outside of this. Tether Note: The following Rule 6.18 and Rule 6.19 will come into force from 1 October 2018. 18. When competing with a guide-runner, athletes in Sport Class T11 and T12 shall be guided through a tether. Note: Only one tether shall be used between an athlete and his guide-runner(s) during a race. 19. The tether shall be made from non-elastic material and shall not store energy and/or offer a performance gain to an athlete. It shall consist of two closed holding loops and a middle section with two fixed spherical stoppers at each end. a) For track events, the maximum length between the two furthest points of the holding loop at the full extension of the tether shall not exceed 30cm. For road events, the maximum length between the two furthest points of the holding loop at the full extension of the tether shall not exceed 50cm. Each tether shall be measured in the Call Room at its full extension when the tether is not being worn. b) The holding loops shall not incorporate any mechanism that allows the loops to open. The holding loops may incorporate a locking mechanism, which can be easily operated by the athlete and that allows the size of the loops to be adjusted and locked. This adjustable locking mechanism shall not in any way be extended beyond the two fixed spherical stoppers and shall not shorten the middle section. The middle section shall be a minimum of 10cm in length and shall be measured at its full extension from the closest points of the two spherical stoppers. The middle section shall be of a distinctive colour and be distinguishable from a distance to the rest of the tether. The stoppers shall be sphere-shaped (or spherical) and a minimum of 1cm in diameter. c) At no point during a race shall an athlete or his guide-runner(s) be permitted to hold on to a stopper and/or any part of the middle section in a way that shortens the length of the tether. If an athlete and/or guide-runner fail to comply with these rules, the competing pair (the athlete and guide-runner) shall be disqualified. Please refer to the diagram using link above – COMMENT: The above diagram shows the minimum and maximum length that must be observed and respected at all times during the races for Track and Road Events. The Call Room Judges will conduct the appropriate inspection and will ensure that the length of the tether complies with the above Rule 6.18 and Rule 6.19.